Monocouche Scratch Render is a dry-mix, one coat, polymer-modified render. Once mixed with water and applied to the wall, it provides an aesthetically pleasing finish that will survive the test of time. The render comes pre-coloured in a choice of 18 colours and, once scratched back, the finish produced is chalky and pitted with a sandstone-like texture. The render is considered to be a traditional render as it is applied in two passes to create a thick coat. Nevertheless, the render is very flexible and crack resistant. We advise that for enhanced tensile strength and stability, a Fibreglass Mesh is embedded within the render. The EWI-090 Scratch Render is a versatile, decorative render that can be applied by hand or by spray machine. Unlike ready-mixed EWI Pro renders, the Monocouche Render comes as a dry-mix, so it requires mixing with water (5.5 litres) prior to application. Monocouche Scratch Render should be applied in temperate weather and should not be used in temperatures above 30°C. Likewise, if the materials or the substrate are frozen, or if there is any risk of frost damage within the first 24 hours, work should be postponed. Monocouche Render should not be applied in rain or humid conditions, or if wet weather is expected before the render has set. Setting time is dependent upon environment and humidity. 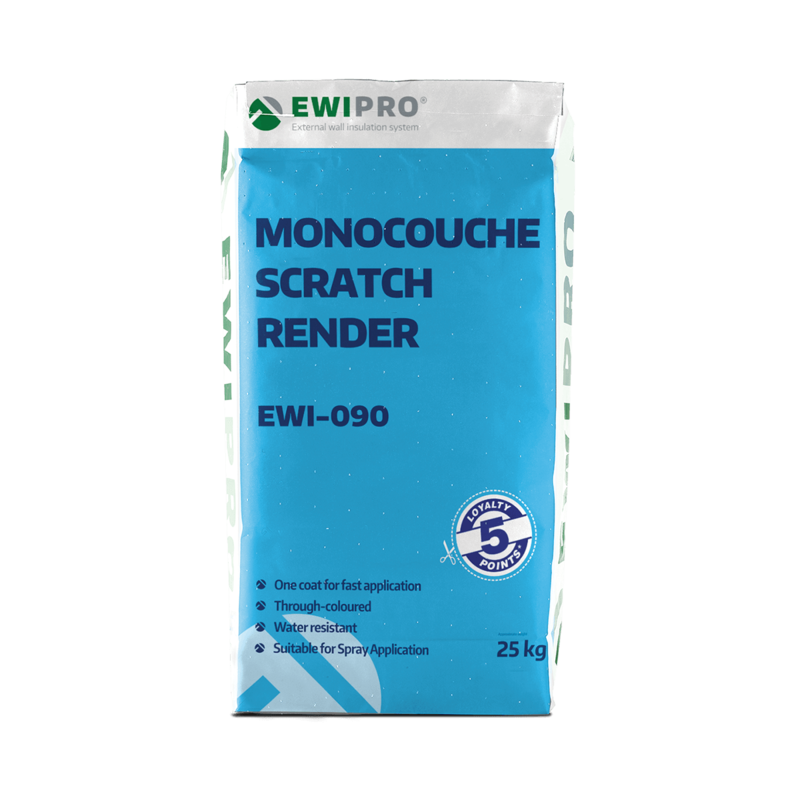 Monocouche Scratch Render Will reach optimal strength after 28 days.